We really enjoyed this tour and guide is fantastic. Definitely recommended. Karina was friendly and knowledgeable and answered all of our questions. Everyone in our group gives her 5 stars. I was thrilled with my tour of Mexico City with Karina. She actually met me at the airport at 5:30 a.m! I only had about 4 1/2 hours before my connecting flight, but she filled them with the essential sights, sounds, tastes, and feelings of the city. Her love of her country was obvious, as well as her knowledge. Taking an individual tour is absolutely the best way to get to know a new place. Karina didn't just introduce me to Mexico City, she gave me an experience that changed me inside. Karina was the most exceptional, and knowledgeable tour guide I have had, took my booking on short notice, had me picked up from the airport and dropped off by Uber. On the short notice late night tour she showed me as much as she could in the short amount of time I had, and showed me some of the best authentic Mexican food Ever! followed up by some of the best Mexican beer I've ever had! very knowledgeable, kind, and really cared about showing me her city that she is very passionate about. #again! Very accommodating and knowledgeable about her country's history. Karina was kind enough to customize a tour due to our tight schedule. Great personality! We are so happy that we booked this tour with Karina. She worked with us before the trip to customize a tour that was perfect! The insights she shared on the history, sights and food of Mexico really enhanced our trip. Karina is warm and personable. It was a real pleasure to spend the day in Mexico City with her. We look forward to booking tours with her on future trips. We thoroughly enjoyed our tour with Karina. She provided a great overview of the sites, history and culture of Mexico City. Karina was an excellent guide. 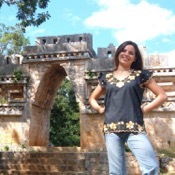 She is very knowledgeable about Mexican history, art and architecture. She is also a very nice person to spend the day with. We will book again. If there were more stars, we would have rated Karina higher. What a joy! She customized the tour on our interests (art, architecture, history, & social justice) and helped us see many details that we would not have recognized on our own. By listening not only to our questions but also our comments about what we appreciated along the way, she was able to personalize her comments and emphasize things she was sure we would like. This was no canned tour; this was a new friend introducing her beautiful city. Karina arrived on time, was flexible with the schedule to accommodate our requests. She is friendly and nice. But if you are looking for a cultural experience and want to learn the history of a country and see the story behind the things you are looking at, you should probably go elsewhere. Maybe your experience would be better if you speak Spanish, our tour was in English. TOUR GUIDE RESPONSE: Dear Lilia, thank you so much for your feedback, it is very important for me. I do apologize if the tour was not what you expected. Best regards. Karina was amazing as a tour guide! Very knowledgeable about the history of Mexico City and the Aztec culture, and she had an excellent agenda laid out for places to go and visit. Her English is perfect, and she even spoke in fluent Portuguese for my Brazilian companion! Pickup was exactly on time, and overall we all had a great time! Love Mexico City, and next time we go back we will sign up for another tour to visit more of the city with her! Karina was amazing, amazing and did I say amazing ! Thank you for everything! She was very flexible and made the whole trip worth every dollar. In my honest opinion if you want a great tour guide Look no further Karina is the one !!! Personally, I plan on going back and will leverage her expertise!!!! Karina is an excellent host and guide. Very knowledgable and amjable. I highly recommend her. Cómo describir a Karina? Es INCREIBLE! Al final del tour nos sentimos más como familia que como clientes. Ella nos hizo sentir como si estubiesemos conociendo a México por primera vez aunque esta sea una de tantas veces que hemos estado ahi. Cuando le dije que quería que mi familia conociera un poquito de la CDMX, ella se encargo de arreglar todo y planear un día que nos dejó con mil ganas de regresar a continuar la gira. GRACIAS por todo, Karina! Esperamos verte pronto (Día de los Muertos?)! Karina was lovely. Excellent English skills and knowledge of the local sites. We had a customized tour for three of Zocalo Square and the surrounding areas including the Temple, cathedral and murals of Diego Rivera. She was flexible about arranging the site around our interest level and came up with a couple great overlooks to get a bird's-eye view of the sites. Thoroughly enjoyed ourselves.